I'm sure you all must think I have a thing for Birds because I've been using them a lot lately in my postings...Rest assured, I do own other stamps - and I've moved onto a new bird image for today's post. Kerry are you afraid of these birds? 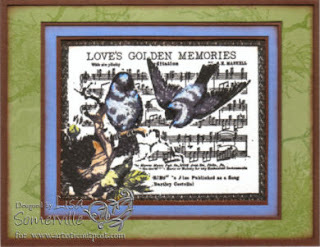 These beautiful images come from the BlueBird Plate by Artistic Outpost. The main image is stamped in Black Archival, colored with my favorite coloring technique - Marker Water Coloring. The images behind the focal image are stamped using the Vanilla Double Technique.